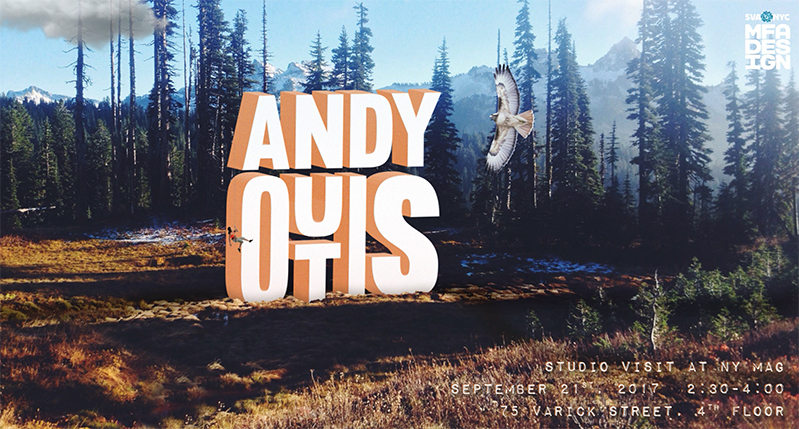 This semester’s first studio visit tomorrow is to alumni Andy Outis (MFAD 06) has worked in the Creative Services department at New York magazine. Initially hired as Art Director, in 2014 he was promoted to Creative Director. He leads a team responsible for branding, promotional collateral, websites and videos for the iconic New York brand, its online verticals, including Vulture and The Cut, and signature events such as Vulture Festival and New York Taste. From 2014 until early 2016, Andy was the creative lead for New York’s Brand Studio, leading custom creative campaigns and digital advertising for a diverse group of clients ranging from HSBC to Marc Jacobs Beauty. Outis was also the Art Director of Climbing magazine, which joined his interest in rock climbing with his career in design. He was also responsible for designing Urban Climber magazine and The Mountain Gazette, and completed full redesigns of all three titles.